Carlo Caliari (1570–1596), also known as Carletto, was the youngest son of Paolo Caliari, better known as Paolo Veronese (15281588), one of the most prolific and successful painters of the Italian late Renaissance. Carlo’s father was born in Verona, hence the name Veronese, but established himself in Venice, where he opened a family workshop. In addition to training his sons Carlo and Gabriele, he worked with his brother, Benedetto Caliari (1538 – 1598). To complete many of his major commissions, Veronese relied on a team of skilled assistants – often members of his family. 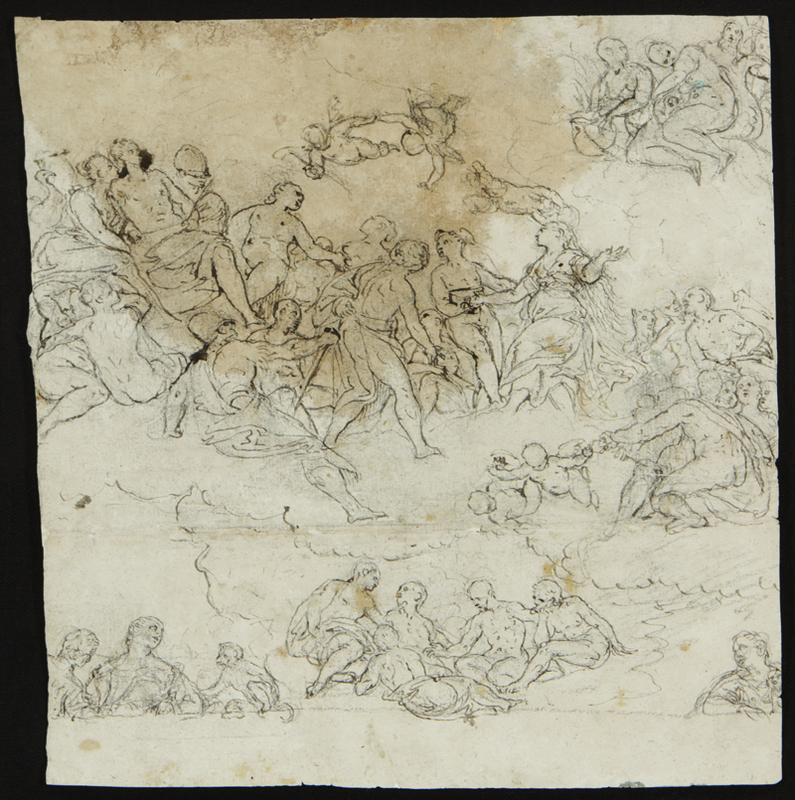 Several works that Veronese left unfinished in death where completed by Carlo, Gabriele and Benedetto. At a very early age Carlo Caliari showed an ability for imitating his father’s works. As one of the most talented members of his father’s workshop, Carlo undoubtedly helped to execute many works that are attributed to his father. His name is attached to several large pictures of banquets in Veronese’s style. Veronese desired to see his son develop his own style, and sent Carlo to work in the studio of the Bassano family. Unfortunately his own personal style did not have time to fully develop, as he died at age twenty-six. Carlo collaborated with his brother, Gabriele, on two large paintings on the doors of the Palazzo Ducale. One of his best works is the St. Augustine Academy of Venice. A number of Carlo Caliari’s works are on display at the Uffizi Gallery in Florence, including The Expulsion from Earthy Paradise (1586), Adam’s Family, Creation of Eve, and Original Sin. Another young painter from Verona, Alessandro Turchi (1578 – 1649), sometimes called Alessandro Veronese, is said to have trained and worked under Carlo Caliari. Hebe, personification of the beauty of youth, is crowned with flowers by a little cupid and handed a cup by Mercury. 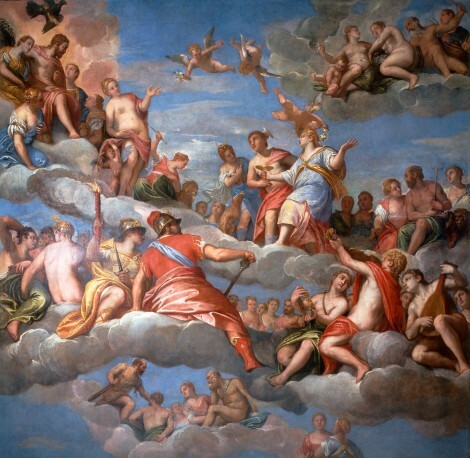 Other gods include Jupiter and Juno (under the eagle in the top left corner), Venus (flaunting herself to their left), Diana (next to Mercury), Minerva and armoured Mars (towards the centre of the canvas), Neptune (with his trident at the right edge) and Hercules (with his club towards the bottom). From the ceiling of a room in the Palazzo Della Torre at Udine. Sold in 1692, and taken to the house of Pietro Businello alla Croce at Venice. Later, probably in the early nineteenth century, it entered the Manfrin Gallery, from which it was sold in 1896. Bought by Mrs Gardner in 1899 from a Parisian dealer. It has been set into a gilded and painted ceiling in the ‘Veronese Room’ at Fenway Court. Late (probably 1580s). A thorough restoration, carried out in situ, was completed in 2001.